Curve Studios has been on quite the roll lately. Over the last several months, they have brought popular indie hits such as Stealth Inc, Thomas Was Alone, and Proteus over to the Playstation Network. This month they have dabbled into the retro world of arcade gaming with Titan Attacks!. This is a clear-cut homage to Space Invaders, and at first glance it doesn’t appear to offer anything new — the opening level is about as familiar as it gets. 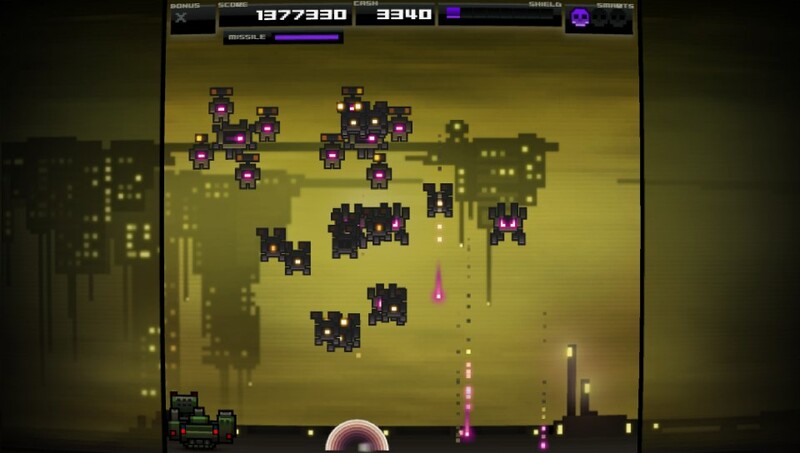 You control a small tank at the bottom of the screen, and you shoot a basic weapon at the aliens directly above you. Both your tank and the aliens can move left to right, and occasionally there is a speedy UFO that floats across the very top of the screen which can be hit for bonus points. In a nutshell, the beginning feels a lot like Space Invaders: 2014 Edition. However, Titan Attacks! quickly opens up after this brief introduction. After every level — of which there are 100 total — you are given the option to upgrade your tank. 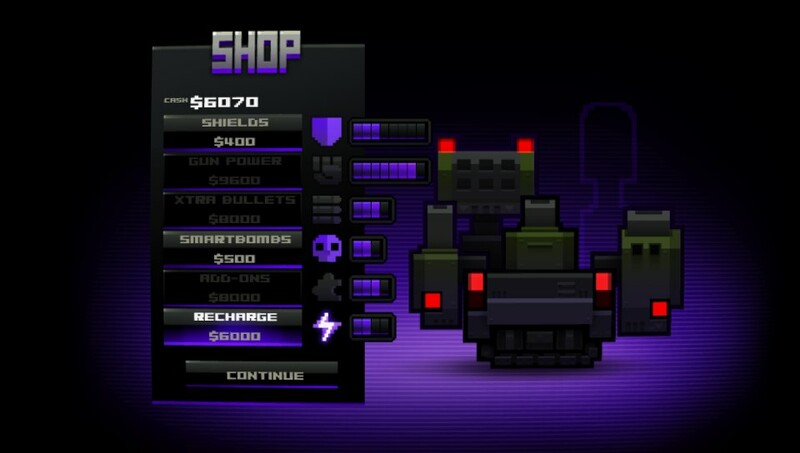 Money that is earned from performing skill shots can be used to buy shields (aka health points), ammo, smart bombs (handy explosives that decimate everything on screen), as well as crucial weapon add-ons. As the game progresses, so does the size of your tank. The changes are noticeable on screen, and by the time you reach the later levels your tank will be a hulking behemoth ready to annihilate everything in sight. This form of leveling up adds a unique dynamic to a tried-and-true formula, and there’s a real sense of accomplishment when you get your tank to the point where it can handle even the most intimidating foes with ease. Boss battles — found after every 20 levels — are especially exciting, as the alien motherships require some slick maneuvering to take down. Unfortunately, once you manage to upgrade most of your tank’s options, the game becomes too easy. By the time I hit level 80, my tank was nearly maxed out, and I was whipping through every level in a matter of seconds. I was still having a great time, but the lack of a real challenge was disappointing. After completing the game’s 100 levels, you start right back over at the beginning with all of your upgrades in tact. The goal at this point is seemingly to see how many points you can rack up, but your tank should be powerful enough to coast through every level once again. Unless you have some score-obsessed friends to compare yourself with on the leaderboards, there isn’t much incentive to keep playing. Even the trophies are quick and easy to get — you can max them out in a matter of 2-3 hours with little effort. Although the replay value is limited, there’s no denying that Titan Attacks! is a well-executed and finely-tuned game. You can tell that the developers were passionate about the retro gaming days of yore, and this is a strong homage to one of the all-time greats. Still, a bit more difficulty and further incentives to keep playing would go a long way.